The "street food & sushi" formula here (in keeping with the meaning of the restaurant's Korean name: Yoso) takes its inspiration from the four elements: earth, air, fire and water. YOSO is a Michelin-starred restaurant in Andernach, Germany. Put all ingredients in a saucepan and bring to a boil, then remove from the heat. Pass through a sieve and reserve the liquid. Boil the liquids until they decrease in volume to 100ml. Add the agar and simmer for a further 3 minutes. Remove from heat, allow to cool and solidify. Mix in a Thermomix to obtain a smooth gel. Tip: to make a more homogeneous gel, the total amount of liquid should be 400ml (so multiply above Ponzu gel recipe by 4). The excess, unused gel can be vacuum sealed in small bags and frozen until required. To use again, let the gel thaw and then stir with a whisk until smooth. Remove the avocado’s shell, and roughly chop the avocado. Blend or mix with a fork until it is as smooth as possible. Season with lime juice, salt and chilli powder to taste. If necessary, pass through a sieve. Mix all liquid ingredients and tumeric, and bring to a boil. Put the radish into a vacuum bag and pour the hot liquid over the radish, then seal. Allow to cool, and then cook at 68° C in a water bath. Cut the pickled daikon using a slicer into thin strips. Cut the longer strips into smaller ones, measuring 1.5cm wide and 6cm long for rolling the strips into rolls. Cut the 50g of hiramasa sashimi into three slices for each serving. Put the slices in the cooled ceviche curing liquid for 15min. 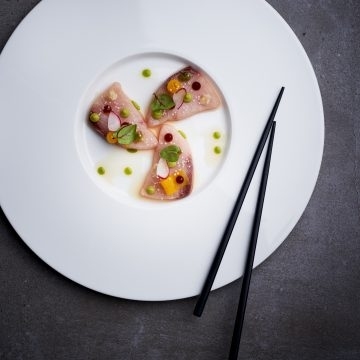 Lay the hiramasa ceviche slices flat on the plate. Dot the plate and ceviche with the avocado mousse. Garnish with mini rice balls, pickled sushi ginger and red-veined sorrel.